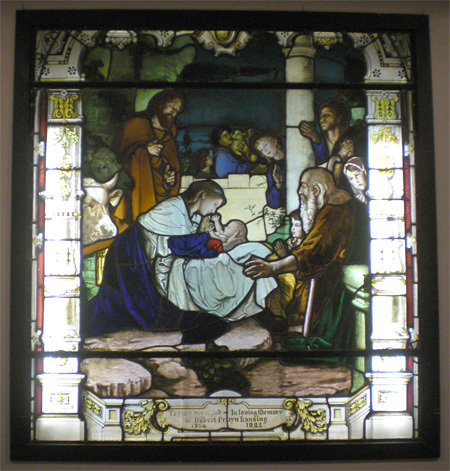 The illuminated window behind the altar in the All Souls Chapel was a gift from Horace Collins and Gertrude Margaret Lansing in memory of their son, Robert Pruyn Lansing, who died on January 3, 1922 of streptococcal meningitis. He was seven years old. Their only son and eldest child, Robert had a sister Dorothy Elizabeth who was baptized at All Souls on December 9, 1919. Two years after Robert’s death, the Lansings had a second daughter, Sylvia, who was baptized at All Souls on July 20, 1924. Robert was cremated, and his ashes were interred at Sunset View Cemetery in El Cerrito. Robert’s mother was born Gertrude Coen in New South Wales, Australia of Canadian parents. His father, Horace, was born in 1880 in Chillicothe, Ohio and died in 1957 in Berkeley where they made their home. Horace was a member of the Ohio infantry during the Spanish-American conflict of 1898, a conflict that was a result of U.S. intervention in the Cuban War of Independence. He was commissioned first lieutenant in the United States signal corps and served two years in Cuba. By 1920 he was a bonds salesman in the Bay Area and ten years later became the manager of a bonds firm. The window is a reproduction of a well-known fresco painting “The Nativity” dated 1885 by the German artist Carl Mueller. 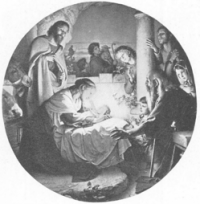 Mueller was the director of the Academy of Art at Dusseldorf and a member of a school of religious painters known as the “Nazarenes.” He studied fresco painting in Italy in 1839 and returned to Germany to create paintings in the church of St. Apollinaire at Remagen. His religious paintings were considered his best work, and he was represented at the Paris Salon of 1853. There are various spellings of Mueller’s name. The original spelling was Karl Müller, but references in American newspapers in the 1940s cite Carl Mueller or Muller, anglicized perhaps because of sensitivity to German names during the war. The window was originally installed in the old church behind the altar. When the old church was replaced in 1955, the window was cut down to fit in the new chapel and fitted accordingly. Moving and trimming the window was a way to preserve it along with other memorial brass plaques. Technically, it is a combination of stained glass and painting, a common practice at that time. The window serves not only as a memorial to young Robert Lansing but also as a reminder of the history of the All Souls Parish church.